The first day of Andy’s Thailand fishing holiday saw the angler fishing for Mekong Catfish at Bungsamran Lake in Bangkok. On arrival at the lake the angler cast out sliding float rigs baited with large balls of groundbait towards fish showing in the central part of the lake. After waiting for only a few minutes one of the rods ripped off as an angry Mekong Catfish snapped up the ball of groundbait. Winding down into the Mekong Catfish saw the rod take on a healthy bend as the Mekong Catfish powered off across the lake. Andy battled the Mekong Catfish for several minutes before the fish was brought into netting range and scooped up in the waiting landing net. 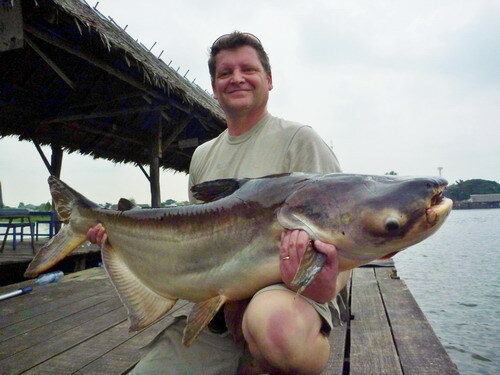 The Mekong Catfish was estimated to weigh 20kg’s and was proudly held aloft for the camera and trophy shots. Further casts towards the centre of the lake soon resulted in more fish with Mekong Catfish being landed with weights between 10-20kg’s. The days fishing continued in much the same fashion with Andy bagging several Striped Catfish to 12kg’s in addition to landing a succession of Mekong Catfish. At the end of the days Bangkok fishing at Bungsamran Lake the angler had succeeded in amassing a large double figure haul of Mekong Catfish and Striped Catfish topped by several specimens approaching the 30kg region.